A Santa themed birthday party is always fun and festive! 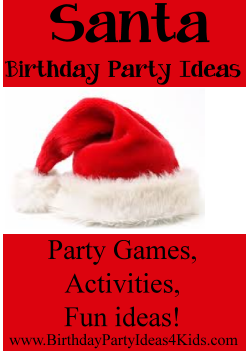 We've listed our favorite party games, activities and ideas all with a Santa theme that will make party planning easy! A Santa theme is great for kids, tweens and teens of all ages! You will need: Large rolls of green crepe paper, hats and plastic ornaments for each team. Divide guests into teams of 2 or 3. Each team gets two rolls of crepe paper. Decide who in the team will be the tree and who will do the trimming. On “go” teams wrap their tree with the green crepe paper. When the crepe paper is all around the “tree” then they have to decorate the “tree” with the hat and plastic ornaments. The first team to finish wins. Have enough crepe paper so each guest gets a chance to be the tree. You will need: A stocking and spoon for each team plus small objects such as jingle bells, wrapped candy or ping pong balls. One at a time team members take the spoon and place a small Christmas themed object on it (jingle bells, stars, ping pong balls), run to their stocking and place the object inside and then run back to their team and hand off the spoon to the next player. The first team who fills their stocking wins! Punch a small hole in the bottom of each plastic cup and insert a candy cane halfway through the hole where the hook of the candy cane is on the outside of the bottom of the cup. Each team gets 10 marshmallows. The object of the game is to transfer the marshmallows from one person to the next without using their hands. The first team that moves all 10 marshmallows down the line in their team wins! Have an adult dress up in a Santa suit or hire a professional party entertainer to play Santa for the party. Give each child a chance to sit on his lap and tell him what they would like for Christmas. This is also a great photo opportunity to take a picture and send it to the party guests later with a thank you card. Have the party guests go on a Christmas scavenger hunt. Our Christmas scavenger hunt list has lots of fun items to find and is free to print out. Fun party game for all ages! Guests bring unwanted or funny gifts to the party and exchange them with other guests. Complete instructions and details on how to play the White Elephant party game.